Google has just launched a developer preview of AMP Stories – which are slideshow-style presentations that will soon be appearing in search results. 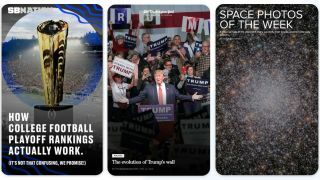 AMP Stories work on desktop and mobile devices, but are particularly suited to smaller screens, letting you tap your way through pictures, videos and text – just like stories on Facebook, Instagram or Snapchat. AMP (Accelerated Mobile Pages) is an open source technology that uses a kind of stripped-down HTML to make pages load faster. The project is backed by Google, and was launched as a competitor to Facebook’s Instant Articles. Anyone can publish a regular AMP page, but for the time being, Google is only showing AMP Stories from a small collection of publishers. It's not yet clear how Google will present AMP Stories in regular search results, but you can see how they’ll will look by visiting http://g.co/ampstories on your phone and searching for CNN, Conde Nast, Hearst, Mashable, Meredith, Mic, Vox Media or The Washington Post.